Teaching while pregnant is no picnic. Add morning sickness to the mix and you might be wondering if you're going to make it. 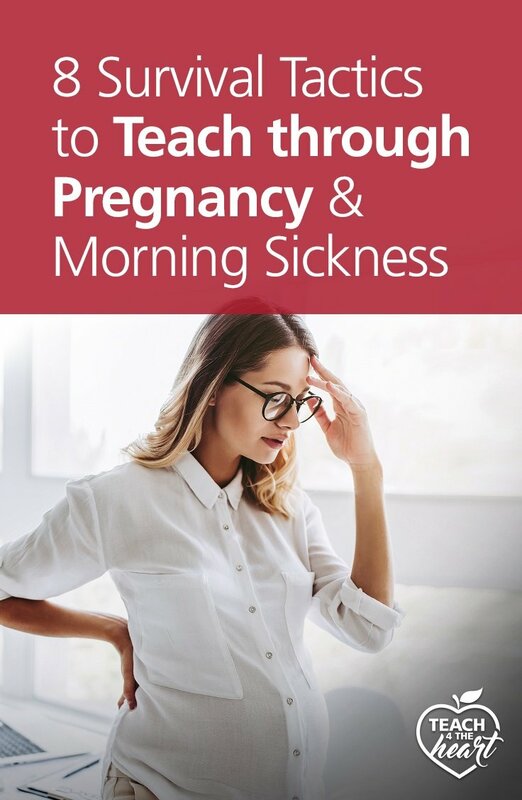 Here are some tips to deal with morning sickness and other pregnancy symptoms while teaching. Teaching when pregnant can be downright challenging. You’re already tired from the day-to-day demands and now your body is growing a tiny human in the midst of it all. 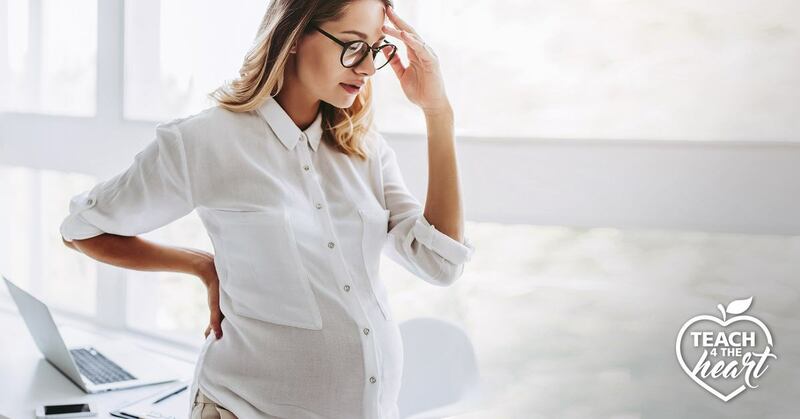 Add morning sickness into the mix and you might be wondering if you’re going to make it – particularly through that grueling first trimester. But the good news is that you’re not alone. 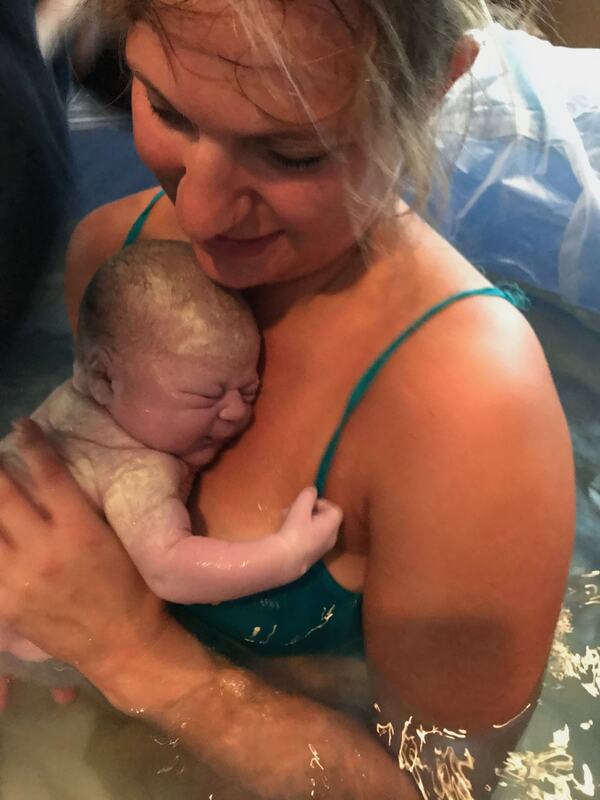 You have a whole tribe of women around you (including me) who have survived teaching while pregnant and are ready to offer some pointers to get you through. Disclaimer: I am not a medical professional or a certified anything. So please do not take this as medical advice. Please discuss all supplements, essential oils, and treatments with your doctor or midwife first. These are only suggestions of things you might want to discuss and try. 1. Don't let your stomach get empty. Whether it’s crackers, soda crackers, ginger snaps, mints, sour candy, or gum – find something that helps settle your stomach and keep it on hand. An empty stomach makes morning sickness so much worse, so keep nibbling throughout the day – even when you’re teaching. I remember trying to sneak some crackers in the middle of class, hoping my 8th graders wouldn’t notice, as we hadn’t announced the pregnancy yet. And if morning sickness is particularly troubling in the morning, keep something by your bed and take a few bites before you even get up. 2. Enlist another teacher to help. I’m so thankful my morning sickness was more of the “I feel horrible” kind than the “I’m literally throwing up kind”, but if yours includes the latter, find another teacher near you to have your back. Set it up that if you need to run to the restroom, you can bang on their door on the way and they'll keep an eye on both classes or phone for help. 3. Take iron and/or B vitamins to keep up your energy. Remember to check with your doctor or midwife, but simple supplements like B6 or iron can work wonders. B6 and other B vitamins help keep your energy from plummeting. And if you’re anemic (low iron), adding an iron supplement can be a huge help over time. I take iron every pregnancy, and I can tell a distinct difference in my energy when I do and don’t have enough iron in my system. Make sure you get one that’s gentle on your stomach. 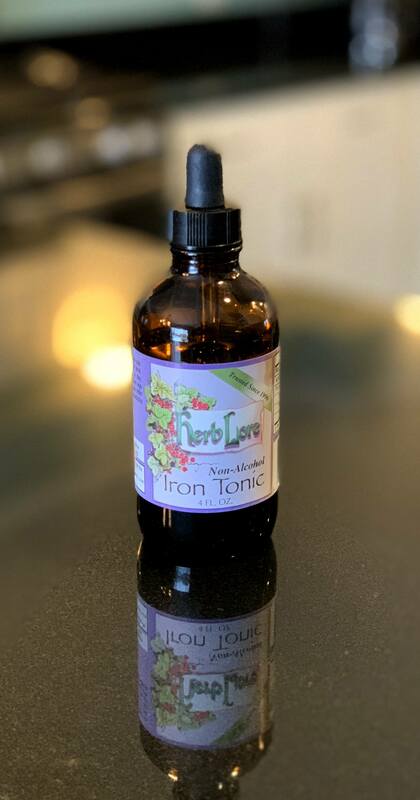 I love this iron tonic from herblore. Water is #1, but some teachers recommend lemonade, Gatorade, tea, or Ginger Ale. See what works for you, but regardless, keep drinking. I find that a vacuum-insulated water cup (like Yeti or a less-expensive off brand) keeps my water cool all day helps me drink more. Keep it at your desk or podium and make it a point to continue drinking even while you’re teaching. I’ve never personally tried these, and *full disclaimer* I don’t know which of these types of bands are safe for pregnancy, but some teachers recommend trying nausea-relief wristbands. If nausea is a big problem for you, it might be worth a try. This one looks promising. Protein is important for a healthy pregnancy anyhow, but some teachers also notice a difference in their nauseau and energy levels when they eat more protein. Bonus points if you break it up into small meals and snacks throughout the day. 7. Sniff or diffuse essential oils. Essential oils provide natural remedies for a variety of issues, and morning sickness and other pregnancy symptoms are no exception. Another option is to diffuse essential oils with a diffuser like this one, which releases the oils into the air in a fine mist. Lavender is a fantastic oil to diffuse both at home or at school as it helps reduce stress and anxiety. Click here to find out more about how to use essential oils. No matter what you do, pregnancy is going to zap your energy, especially in the first trimester. Realize that you are in a unique season of life and take as many naps as you need. And, yes, I know how impossible it can feel to find time for naps as a teacher. But I’m telling you – your body needs more rest, and you will be more effective (and efficient) if you stop feeling guilty and choose to rest when you can. Finally, remember that this is not your new normal but only a season. Give yourself grace. Make the necessary accommodations to get through the next few months. Realize that teaching while pregnant will, by necessity, be different than teaching while not-pregnant. And find hope in the fact that you won’t feel like crap forever. And that all of this will be more than worth it. And if you’re planning a maternity leave, may I recommend my friend Elizabeth Chapman’s book The Stork Doesn’t Deliver Lesson Plans: A Teacher’s Guide to Maternity Leave and Beyond. The book will do just what the title suggests – guide you through this unknown time and help you plan for an effective, relaxing leave and the new normal that comes afterwards. #4 coming late March/early April. We would love your prayers! Did you find this post helpful? Clue in your fellow teachers by sharing the post directly (just copy the URL) or by clicking one of the buttons to automatically share on social media. Please note that this post contains affiliate links, which means that if you decide to purchase a product or resource after clicking on those links, Teach 4 the Heart will receive a small commission at no additional cost to you. Of course, we only recommend products we truly believe will be helpful. Thanks for helping support Teach 4 the Heart in this way.